Congratulations to the new Mrs. Shulman! I adore Anne Hathaway. She is a wonderful actress and truly seems to be a down to earth celebrity which in this world is refreshing. She also has a great sense of style and often tops my best dressed list. Naturally when it came to her big day she did not disappoint with her bridal look. 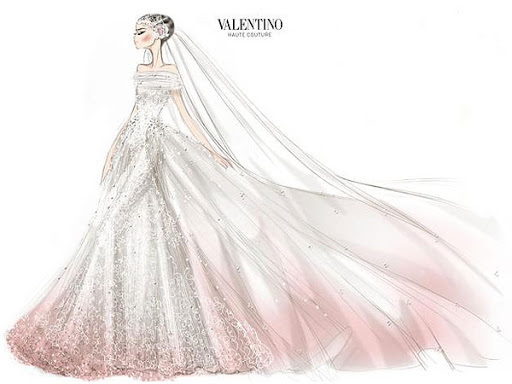 Decked out in a strapless ivory silk point d’esprit tulle dress from Valentino, which included a pink hand-painted shaded train embroidered with satin flowers, she dazzled. The icing on the cake though was her 1920s-inspired veil and head piece. It consists of a lace ribbon with a large flower and is adorned with small crystal beads. With her pixie hair cut it was the perfect vintage touch to her ensemble. What did you think of Anne Hathaway’s wedding look? Would you wear a head piece like hers?